We thank Wellfleet Cultural Council, Wellfleet Recreation & Preservation Hall for their support (see below). 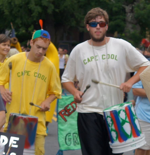 Cape Cool drummers and dancers of all ages carried the spirit of samba out of the Hall and onto the street on Independence Day, sharing people-powered rhythms with paraders and parade-watchers young and old. 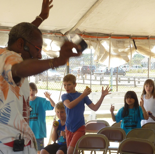 Master Afro-Latin drummer and teacher Cornell Coley will return to Wellfleet on July 3-4, 2015 to inspire walk-and-rollers of all ages to make our own live music, drumming, dancing, stilt-walking, biking and skating in a people-powered parade –– Cape Cool Bucket Drum Samba has won “best band” award for 3 years running. 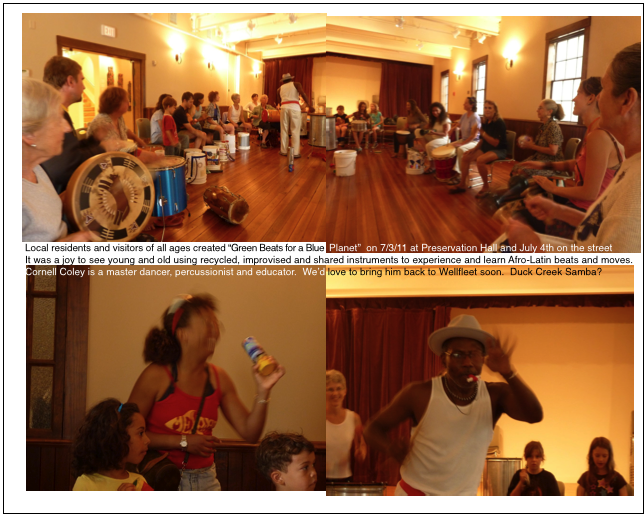 7/3 : 9-12 noon FREE ALL AGES rhythm workshop Wellfleet Rec. 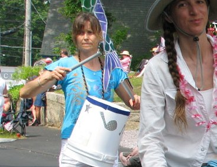 Tent; 7/4: PARADE! Join Us!